College is a time of change, growth, and excitement. You move away from home for the first time, meet new people, and begin your journey into adulthood. Gina, like many other teenagers, was eager to take this next step in life. She had always dreamed of attending a school far from home but knew she could not do it on her own. Gina has cerebral palsy which affects her body movement and muscle coordination. She needs help getting dressed and picking things up from the ground. With all new people in a new city, Gina knew she had to find an alternative for help. She began to research service dogs after a few of her friends had recently received service dogs. Gina found CPL through a google search. She applied and was matched with her first service dog, Concord, in 2000. Meeting Concord and going through training was overwhelming. Gina knew having a service dog would change her life but didn’t realize how much hard work went into the partnership in the beginning. Gina has a Type A personality and admits she expected her dog to be perfect and do everything right on the first try. She quickly learned that dogs are not perfect and she needed to give the partnership time to strengthen. Gina persevered and completed training. Looking back now, she is incredibly happy and thankful she put in the time and stuck with it. Concord made her dream of attending college a reality and shortly after being matched, the pair moved across the country to attend school together at The University of Arizona. Unfortunately, college didn’t start off as planned. Concord became suddenly ill and had to retire after Gina’s first semester. 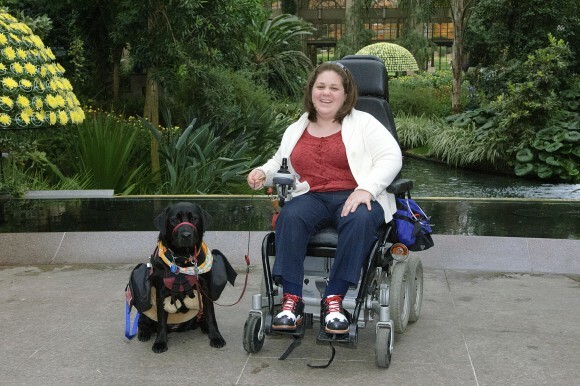 Gina made the decision to continue school and completed her second year of college without the help of a service dog. It was during that time that Gina’s need for assistance became evident. She did not want to complete another year of school alone so applied for a successor dog and was matched with Jinks the summer before her junior year of college. Going through training with Jinks was much easier because Gina knew what to expect. Jinks and Gina had a very successful partnership. With Jink’s help, Gina was able to graduate from college and enter the working world. 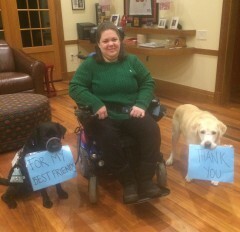 When it came time for Jinks to retire Gina immediately applied for another service dog and was matched with her third and current service dog, Susie, a bubbly black Labrador. Gina recently accepted a new job with the United States Federal Government in Washington DC. Accepting this position was a big transition for Gina. After working in the same building for eight years, she was comfortable with her coworkers. Moving to a new building with unfamiliar surroundings and people was a true test of her partnership with Susie. Gina had to rely solely on Susie throughout the day for assistance and Susie did not disappoint! Susie helps Gina navigate through the office and assists her with tasks throughout the day, like picking objects up that she drops and pushing buttons to operate doors or elevators.